Do not turn at end of row 36, ch 1, work 54 sc evenly spaced along left edge of dress (should be right side of dress facing). Fasten off. With right side facing (right edge of dress), join pink in end of row 1, work 54 sc evenly spaced along right edge of dress. Fasten off. Rows 2-13: Ch 1, sc in BLO of each st across, turn. (54 sts) DO NOT FASTEN OFF. 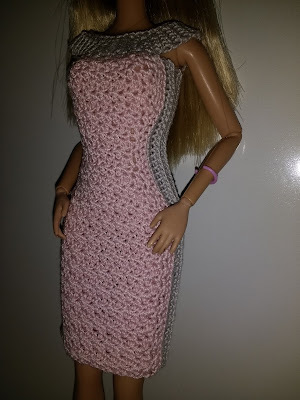 Turn dress inside out and with right sides facing each other, sc back seam closed (about 25 sts or just enough to leave back opening big enough to slip dress on doll). Sew back of collar (about 7 sts on each side) to back of dress. Sew 3 snaps to back opening of dress. Here is a cute coat pattern for Barbie. 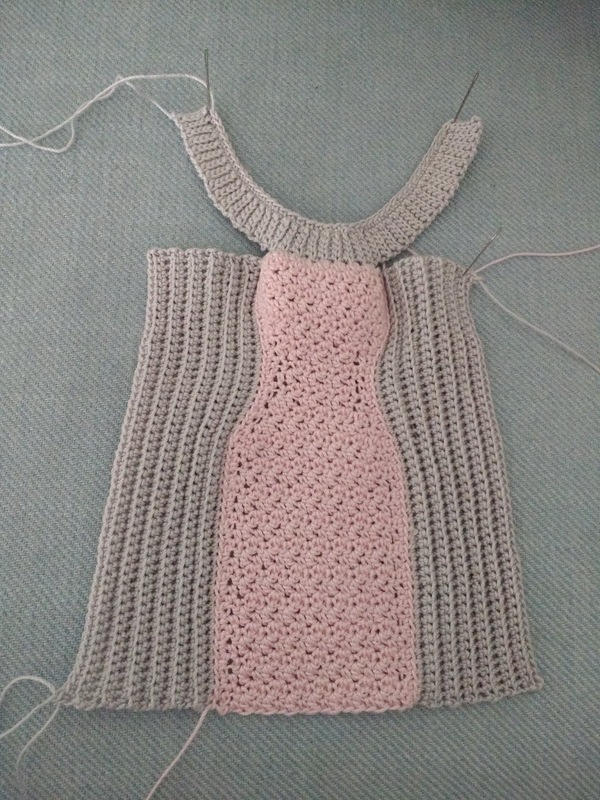 I paired my favorite color combo from the '80's-pink and grey-with a '50's style silhouette. I plan on making a matching dress, bag, and hat in future posts. 9 dc sts = 1"
4 dc rows = 1"
1. Ch 3 counts as first double crochet throughout pattern. 2. 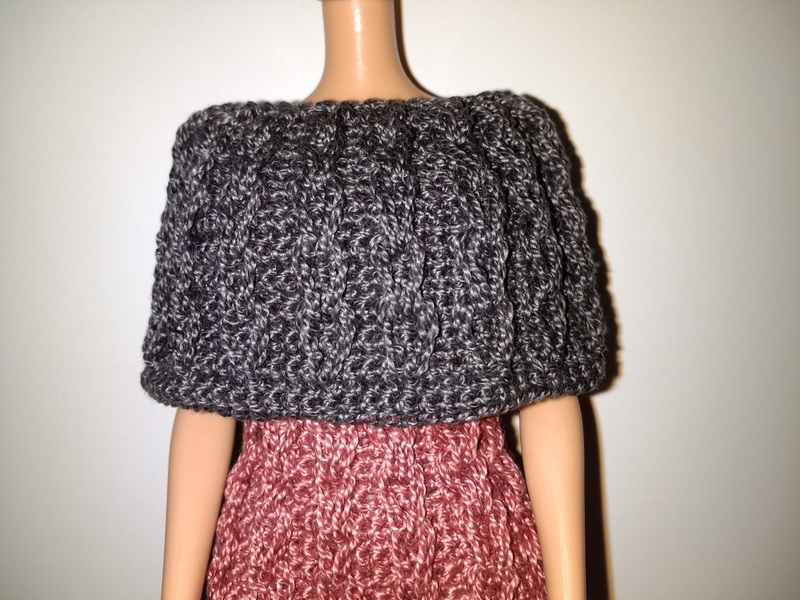 Coat is worked from waist to hem first and then from waist to shoulders. 3. I worked all dc's in either the front or back loops to give the stitches a little bit of texture, because I do not like the look of plain dc's, but you can certainly work the dc's like normal instead if you prefer. Row 16: Repeat row 10 once more. Rows 4-5: Repeat rows 2 and 3. Row 12: Ch 1, sc in first 5 sts, sl st in next 7 sts, sc in last 5 sts, fasten off. Sleeves (Make 2): With right sides facing, sew shoulder seams together. Row 16: Join pink with sl st in any st, ch 1, sc in first st, sk next st, 5 dc in next st, (sk next st, sc in next st, sk next st, 5 dc in next st) 4 times, sk last 2 sts, join to beg sc, fasten off. Rows 2-3: Ch 1, sc in each st across, turn. (54 sc) Fasten off at end of last row. 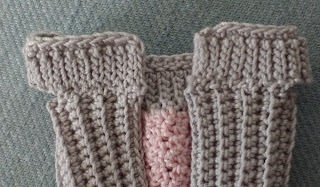 Row 1: With WRONG SIDE facing you, work 97 sc across bottom of coat (2 sc in end of each button band and 1 sc in each st), turn. Row 2: Ch 1, sc in first st, (sk next st, 5 dc in next st, sk next st, sc in next st) across. Fasten off. 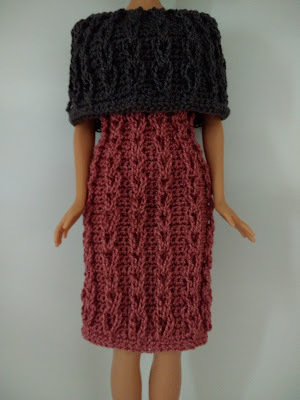 Row 1: With right side facing, join pink at top of right front and work 25 sc evenly spaced around neck of coat, turn. Row 2: Working in BACK LOOPS ONLY (so collar will fold down more easily), ch 1, sc in first st, (sk next st, 5 dc in next st, sk next st, sc in next st) across, turn. Row 3: Ch 1, sc in first st, (sc in next st, hdc in next st, dc in next st, hdc in next st, sc in next 2 sts) across, turn. Row 4: Ch 1, sl st in first st, (sc in next st, hdc in next st, dc in next st, hdc in next st, sc in next st, sl st in next st) across. Fasten off, leaving long thread to tack collar down to coat. Sew 9 buttons to button band opposite of buttonholes. 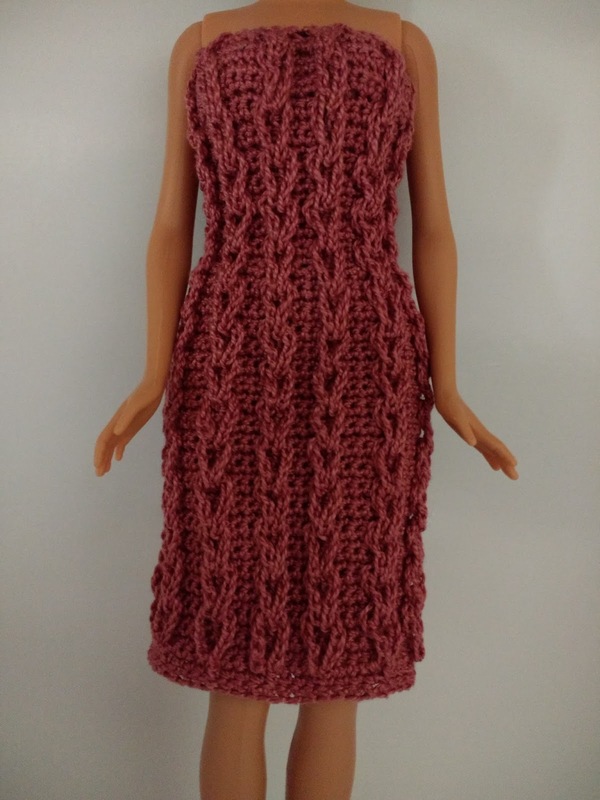 Here is the cable loop dress. 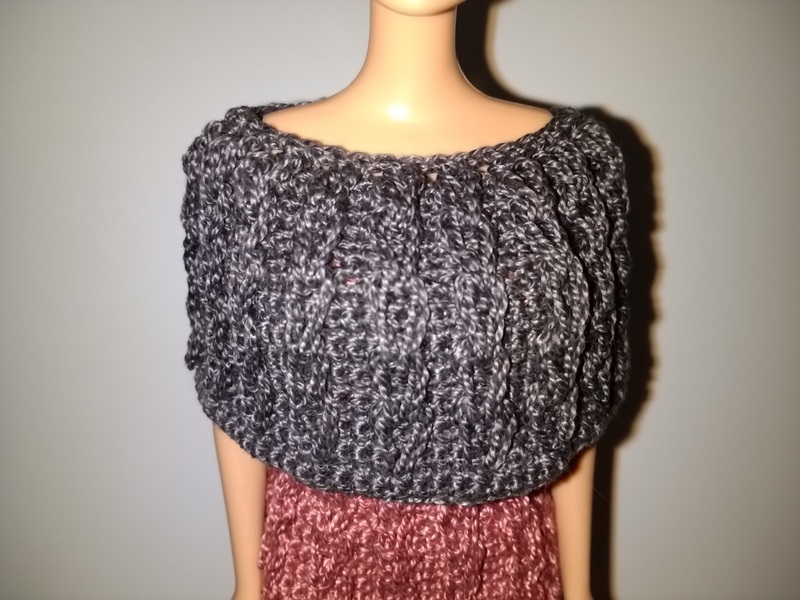 Can be worn with the cable capelet from previous post. I used the stitch pattern from https://www.fairfieldworld.com/project/crocheted-cable-loop-pillow/. Here is what the piece looks like before loops are woven together. It's a hot mess with all the loops hanging around, but it looks nice once it gets woven together. Note that I worked the piece flat and sewed up the back seam, but I am writing the instructions to be worked in the round. NOTE: Even though piece is worked in the round, I still turn piece at end of each round to keep more easily to the pattern. The loops that are formed will not be woven together until the last row, so make sure to keep loops all on the right side of piece as you are working. Rounds 6-37: Repeat rounds 2-5 eight more times. Finishing: Sew 3 snaps to back opening. Weave in all ends. Here is a quick and easy capelet for Barbie. The dress shown in pictures will be in the next post. 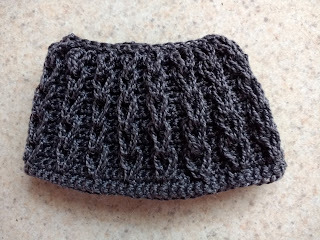 I used the stitch pattern from https://www.fairfieldworld.com/project/crocheted-cable-loop-pillow/. 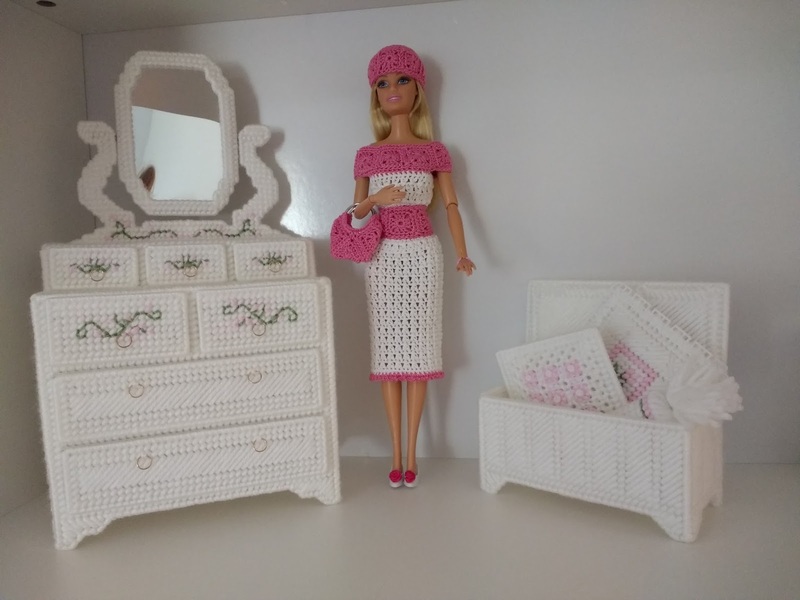 There are more pictures there to follow if you need extra help following this pattern. I took multiple pictures of the capelet on the doll, but could not get any that showed the stitch definition better. 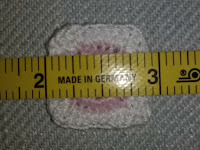 The second picture shows best what the stitches looks like. Rounds 6-17: Repeat rounds 2-5 three more times. Round 23: Ch 1, sc in each st around, join. Fasten off. Weave in ends. Ok, I promise this will be the last granny square outfit for now. 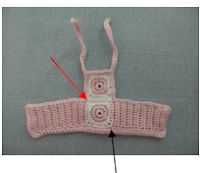 Note: the pattern for the hat and purse shown in pictures are in the previous blog post. 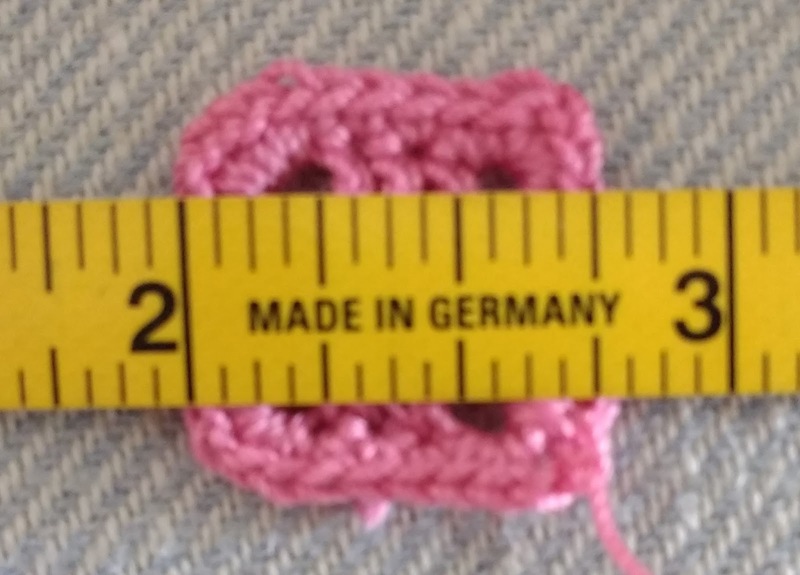 Granny Square = 3"x 3"
Ch 3 counts as first dc throughout pattern. Round 2: Ch 3, 2 dc in ch 2 space (slightly behind joining st of previous round), skip next dc cluster, *(dc cluster, ch 2, dc cluster) in next ch 2 space, skip next dc cluster, repeat from * 2 times, dc cluster in beg ch 2 space, ch 2, join to 3rd ch of beg ch 3. Round 3: Ch 3, 2 dc in ch 2 space (slightly behind joining st of previous round), skip dc cluster, dc cluster between next 2 clusters, skip dc cluster, *(dc cluster, ch 2, dc cluster) in next ch 2 space, skip dc cluster, dc cluster between next 2 clusters, sk dc cluster, repeat from * 2 times, dc cluster in beg ch 2 space, ch 2, join to 3rd ch of beg ch 3. Round 4: Ch 3, 2 dc in ch 2 space (slightly behind joining st of previous round), skip dc cluster, (dc cluster between next 2 clusters) twice, skip dc cluster, *(dc cluster, ch 2, dc cluster) in next ch 2 space, skip dc cluster, (dc cluster between next 2 clusters) twice, sk dc cluster, repeat from * 2 times, dc cluster in beg ch 2 space, ch 2, join to 3rd ch of beg ch 3. Round 5: Ch 3, 2 dc in ch 2 space (slightly behind joining st of previous round), skip dc cluster, (dc cluster between next 2 clusters) 3 times, skip dc cluster, *(dc cluster, ch 2, dc cluster) in next ch 2 space, skip dc cluster, (dc cluster between next 2 clusters) 3 times, sk dc cluster, repeat from * 2 times, dc cluster in beg ch 2 space, ch 2, join to 3rd ch of beg ch 3. Round 6: Ch 3, 2 dc in ch 2 space (slightly behind joining st of previous round), skip dc cluster, (dc cluster between next 2 clusters) 4 times, skip dc cluster, *(dc cluster, ch 2, dc cluster) in next ch 2 space, skip dc cluster, (dc cluster between next 2 clusters) 4 times, sk dc cluster, repeat from * 2 times, dc cluster in beg ch 2 space, ch 2, join to 3rd ch of beg ch 3. Round 7: Ch 3, 2 dc in ch 2 space (slightly behind joining st of previous round), skip dc cluster, (dc cluster between next 2 clusters) 5 times, skip dc cluster, *(dc cluster, ch 2, dc cluster) in next ch 2 space, skip dc cluster, (dc cluster between next 2 clusters) 5 times, sk dc cluster, repeat from * 2 times, dc cluster in beg ch 2 space, ch 2, join to 3rd ch of beg ch 3. Fasten off. 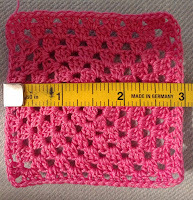 Join 2 full granny squares together at two sides to form a tube. Join pink with sl st in any st, ch 3, 2 tr in same st, 3 tr in each st and each ch 2 space around, join to 3rd ch of beg ch 3. Fasten off. Sew snap to back opening. Sew granny square for back of jacket (rounds 1-6 only) and 4 granny squares for front of jacket (rounds 1-3 only) together as shown in picture below. 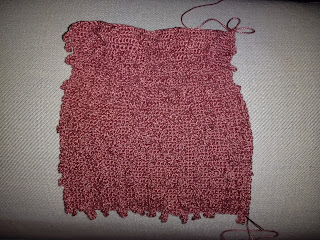 Note that only 1 of the small squares is attached to the large square on each side (leave the other small squares unattached for armholes). 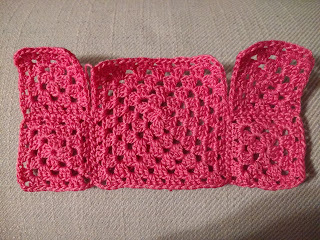 The two small squares on each side will be a bit taller than the middle bigger square. 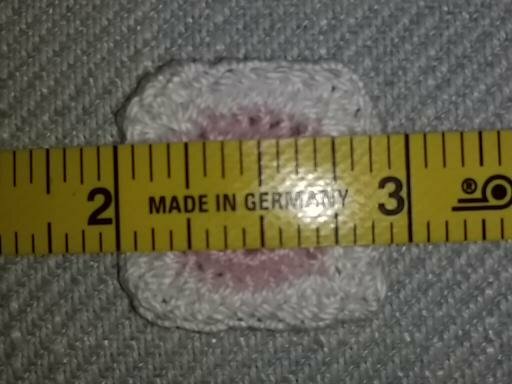 With RS tog, sew shoulder seams together for about 5 stitches (this will only be to about the middle of the small squares). Fold each sleeve square (rounds 1-5 only) in half with RS facing and sew together to form underarm seam. 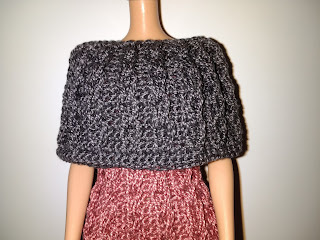 Turn sleeves right side out and Sew sleeves to armholes. NOTE: You will only be doing sc across the bottom of jacket in row 1. 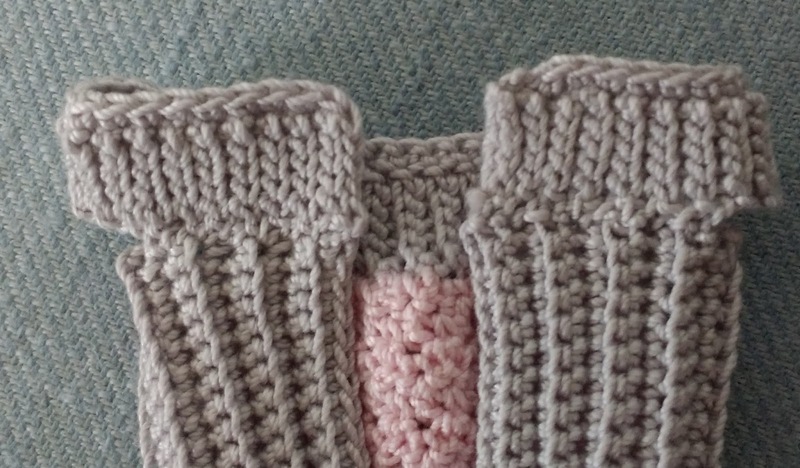 Rows 2 and 3 are worked around rest of jacket for button band, but not worked across bottom. The 33 sc worked across the bottom of jacket is approximate and does not need to be exact. It is just to cinch the waist in. Row 1: With jacket upside down and RS facing you, join pink with sl st, ch 1, sc in same st, sc next 2 sts tog, (sc in next st, sc next 2 sts tog) across (approximately 33 sts), 3 sc to turn corner (start button band), 25 sc evenly spaced up right front to the top of jacket, 3 sc in ch 2 space to turn corner, 6 sc across right front to back of jacket, 14 sc evenly spaced across back of jacket, 6 sc across left front to front of jacket, 3 sc in ch 2 space to turn corner, sc 26 evenly spaced down left front of jacket, turn. Row 2: Ch 1, sc in each st around, ensuring to 3 sc in each corner, turn. Row 3: Ch 1, sc in first st, ch 2, sk next 2 sts (buttonhole), (sc in next 3 sts, ch 2, sk next 2 sts) 3 more times, sc in each remaining stitch around, DO NOT FASTEN OFF. Ch 3, 2 tr in first st of bottom, 3 tr in each st across. Fasten off. Sew 4 buttons across from buttonholes. Turn down top right corner of jacket and tack down with a button. Repeat for left side of jacket. I am on a bit of a granny square kick lately. 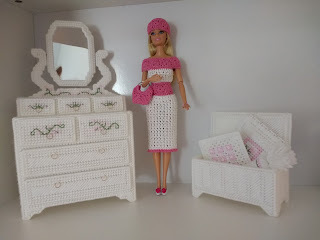 Here is another granny square pattern for Barbie that includes a dress, hat and purse. 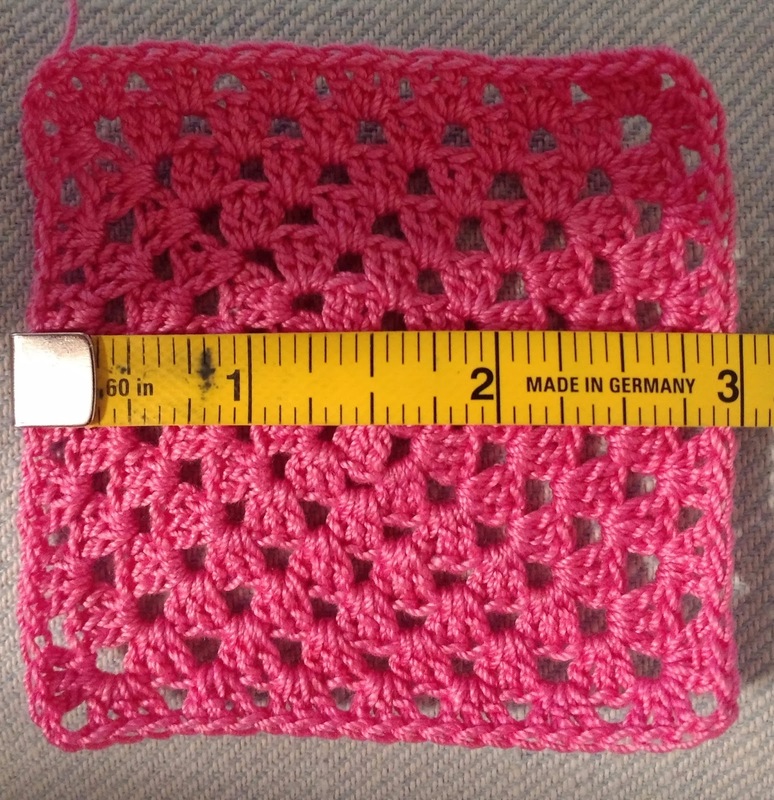 Granny Square = 3/4" x 3/4"
Notes: Ch 3 counts as first dc throughout pattern. 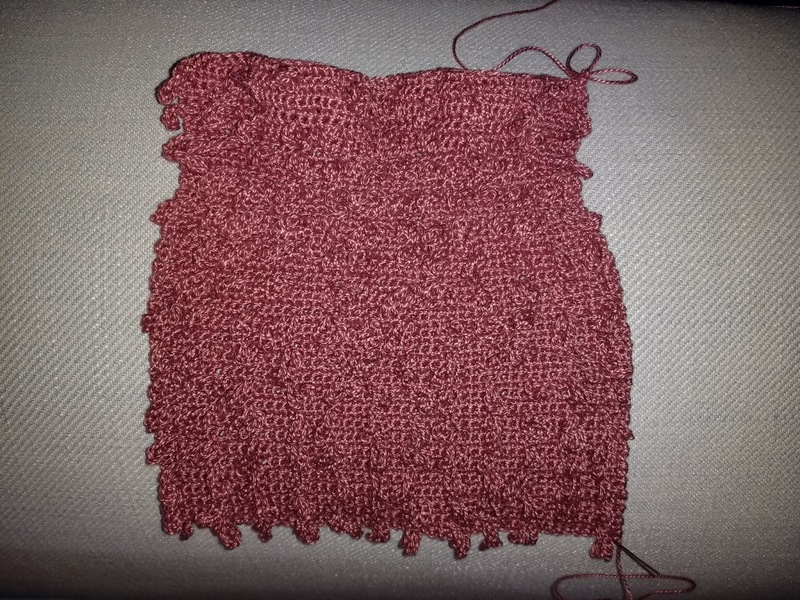 Starting at waist, sew 5 squares together to form a long strip. Join pink with sl st in first st of one long edge, sc 7 across each square, 3 sc in corner ch 2 space, sc 7 across first short edge, 3 sc in corner ch 2 space, sc 7 across each square along second long edge, 3 sc in corner ch 2 space, sc 7 across second short edge, 3 sc in corner ch 2 space, join to beg sc. Fasten off. Round 17: Join pink with sl st in any st, ch 1, sc in same st, ch 2, (sc, ch 2) in each st around, join to beg sc. Fasten off. 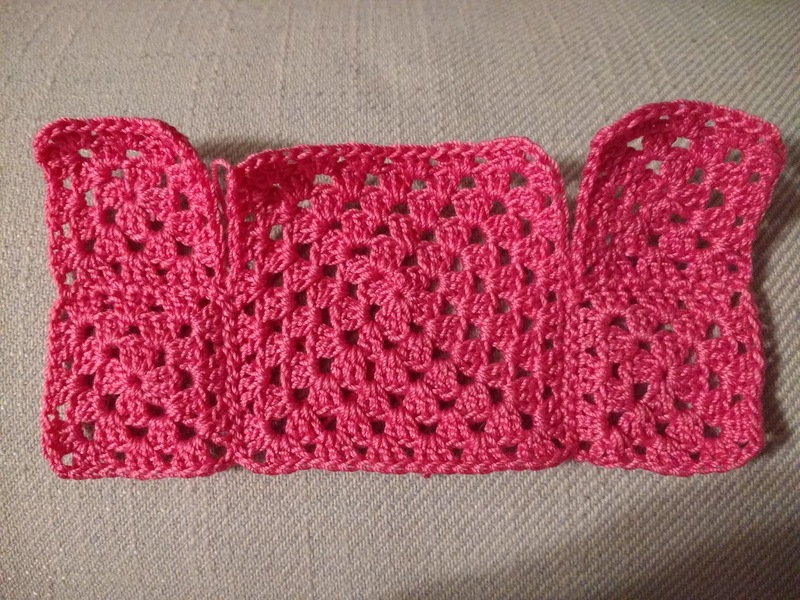 Join 8 granny squares together to form a long strip. Join pink with sl st in first st of one long edge, sc 7 across each square, 3 sc in corner ch 2 space, sc 7 across first short edge, 3 sc in corner ch 2 space, sc 7 across each square along second long edge, 3 sc in corner ch 2 space, sc 7 across second short edge, 3 sc in corner ch 2 space, join to beg sc. Fasten off. 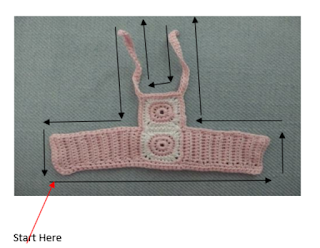 There should be 48 sts along bodice and 58 sts along granny square strip to stitch together. Holding granny square strip and bodice right sides together, join as follows: Starting from right side of dress (as if it were on doll), with white, sl st first 10 sts of granny square strip and bodice together, sl st in next 5 sts of bodice only and skip next 10 sts of strip (first armhole), sl st next 18 sts of bodice and strip together, sl st in next 5 sts of bodice only and skip next 10 sts of strip (second armhole), sl st rem 10 sts of bodice and strip tog, Fasten off. 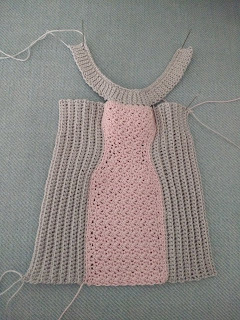 Sew 3 snaps evenly spaced down back opening of dress. Sew 7 granny squares (through round 1 only) to form circle. Round 7: Ch 1, sc in first st, (sc next 2 sts together) around, join to beg sc. (4 sc). Fasten off leaving long thread. Using long thread, weave through 4 stitches of last round and pull tight to close opening. Fold remaining 3 granny squares into triangle shapes and sew seams together (indicated by black arrows). Place 1" ring inside as indicated by blue circle and sc to purse, working around ring (as indicated by red arrows). 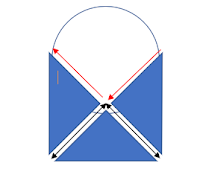 Repeat on other side for remaining 1" ring. Round 3: With white, join with sl st in any st, ch 2, hdc in same st, *sc in next 4 sts, 2 hdc in next st, ch 1, 2 hdc in next st, repeat from * 2 more times, sc in next 4 sts, 2 hdc in next, ch 1, join to 2nd ch of beg ch 2. Fasten off. Sew 2 Granny Squares together along one side. You will start left side of top at ch 1 space indicated by black arrow and start right side of top at ch 1 space indicated by red arrow. Note: I will refer to right and left sides as if the top were on the doll, not as top is facing you. Rows 2-16: Ch 1, sc in BACK LOOPS ONLY of each st across, turn. (10 sc) Fasten off at end of last row. With top RS facing and upside down, join pink in end of row 16 on right side with sl st. Ch 1, sc evenly across bottom edge of piece, 3 sc in corner, sc across short edge of left side, 3 sc in corner, sc across top edge of left side, sc evenly along left side of granny square, when you get to the top of granny square (first strap), ch 21, sc in 2nd ch from hook and in each ch across, join to top edge of granny square, sc evenly across top of granny square, (second strap) ch 21, sc in 2nd ch from hook and each ch across, join to right side of granny square and sc evenly down right side, sc evenly along top of right side, sc 3 in corner, sc evenly down short edge of right side, join to first sc. Sew 2 snaps to back opening. Sew remaining 6 granny squares together in one long strip. Row 1: With back opening of shorts facing, join pink with sl st in ch 1 space, ch 1, sc in same space, sc 41 sts evenly across top of shorts, turn. (42 sts) NOTE: I achieved evenly space stitches by sc2tog in the middle of each square and skipping the last st of each square, for a total of 7 sts in each square. Back Opening: With pink, sc 25 sts evenly around back opening. 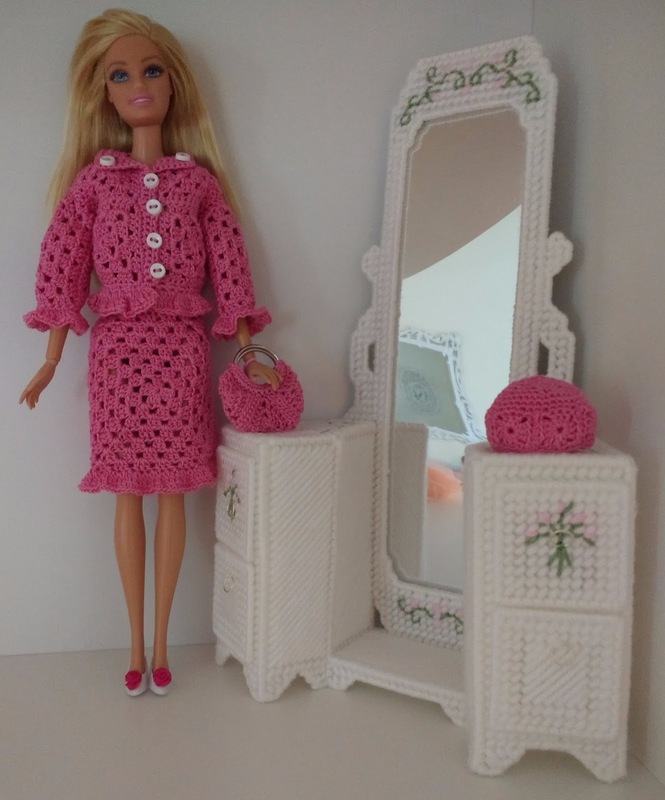 Should I convert some of my patterns to fit Chelsea and Skipper dolls?